On Sunday, Oct. 14, 60 people assembled on Monument Square for the annual, national witness against the Roe vs. Wade Supreme Court decision to allow virtually unlimited abortion. According to Champaign County Right to Life, since the Roe decision more than 61 million infants in the womb have been killed, and more than 2,000 in Champaign County. 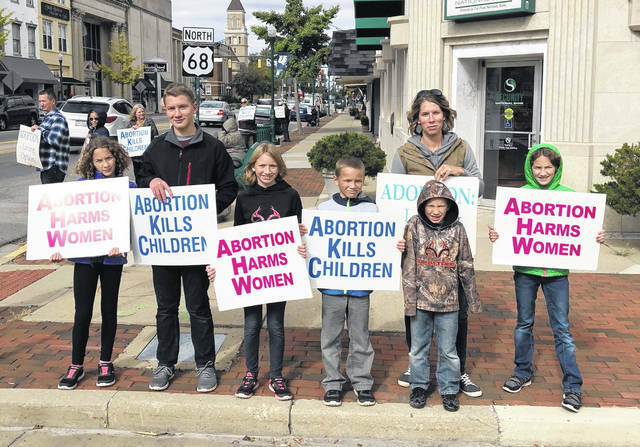 The Sunday event was arranged by Champaign County Right to Life. Attending were pastors Matthew Lee (St. Mary’s), Brian Wonn (First Baptist), and Dave Ridenour, and also seven members of the Knights of Columbus, Council 1727. Participants came from seven local churches. The photograph shows the seven members of the Kevin and Sophia Day family on the Square.